What do you know about my country? Do you want to know the sights, sounds, smells, actions and those things? I can tell you about the wonderful country of El Salvador. El Salvador is a beautiful county. It’s located in Central America. It is a small country, but it is special and wonderful. 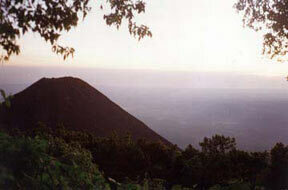 You can enjoy all the things that El Salvador has, like beaches, the gulf, the port and important cities. El Salvador has 14 pretty states. Especially where I was born, La Union. La Union is an adorable place. If you go to La Union, I recommend a beautiful beach called Las Tunas. Las Tunas is one of the most famous beaches in El Salvador. When I went to Las Tunas, I laid down in a hammock in front of the sea. With the little breeze you feel so comfortable and relaxed. La Union also has a gulf called Golfo de Fonseca. It’s a beautiful place where you can see the blue ocean, beautiful natural scenery with warm temperatures. You will also see interesting things like when the light blue of the sky and the blue ocean look like they are touching. If you want to do something fun, you may want to go to Conchagua. There you can go to the park or basketball courts. It’s a place where you can walk, run, and do exciting things. Conchagua is a place that looks like a mountain or hills. You can go hiking and feel the pure air, the wonderful forests, the mountain and the beautiful green of the trees. You can also visit the village of where there is a beautiful Cathedral. I love Conchagua because you can do everything in just one place. La Union also has an important port. Cutuco is one of the most important ports, in El Salvador. It’s a beautiful place where you can see many ships, boats and other things. Cutuco is one important thing for the La Union economy. EL Salvador has many delicious foods. Some of the popular dishes are pupusas and enchiladas. In La Union I know a restaurant where you can eat the most delicious, tasty and hot typical Salvadorian foods. It is the restaurant of my family, Los Ranchos. I recommend the restaurant because you get a beautiful view of El Golfo de Fonceca. The gulf is in front of the restaurant, Los Ranchos is a big restaurant. Everybody in La Union knows Los Ranchos restaurant. The people in El Salvador are so happy. We like to dance. You can hear all types of music, especially Cumbia. Cumbia is popular music in El Salvador. For Independence Day, September 15, the people dance to folk songs in the schools or in the streets during the parade that the students do for Independence Day. The people are very friendly, lovely, kind and nice. In conclusion I love my country. I like how many exciting things you can do in my country. Visit unforgettable places and eat delicious food.